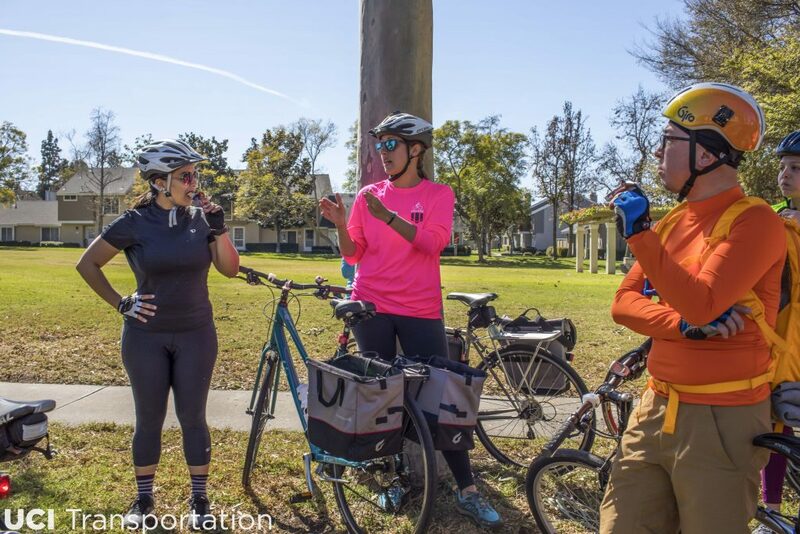 UCI Transportation is proud to offer the League of American Bicyclist’s Smart Cycling, an ongoing program that aims to increase campus understanding of essential cycling skills, including repairing, handling, and riding legally in traffic. Smart Cycling provides a complimentary two-part training seminar offered by our certified League Cycling Instructors. All UCI affiliates and family members 18 and over are invited to attend. This fast paced program includes a 2.5-hour classroom session and a 5.5-hour on-bike session. Classes are held on campus during each quarter, including summer. Participants will receive a League of American Bicyclists “Smart Cycling” student manual ($20 value) and a certificate upon successful completion of the written and on-bike skill-testing examinations. Bonus give-aways include lights, helmets, and multi-tools. For those who attend both sessions and pass a written exam, a certificate of completion will be issued. Trained “Smart Cyclists” are encouraged to participate in campus biking festivals throughout the year, helping to educate their fellow campus peers about cycling skills and safety. Please email biking@uci.edu with any questions or comments. We look forward to seeing you in Smart Cycling! Those who complete the first session will be invited to join the second session of the program, where you will practice your new cycling skills on a nine-mile bike ride. If you also decide to take the written exam and pass, you will receive your own Smart Cycling certificate. Class Registration & Waiver: You will not be able participate in drills or the road skills portion without a signed waiver. To ensure the best experience possible, we advise you to bring sunscreen, water, snacks, closed-toed shoes, comfortable, high-visible clothing (athletic wear), cycling gloves, and bicycle tools. Prior to attending the On-Bike Session, we recommend you take your bike to a local bike shop to have a professional mechanic check brakes, derailleurs, chain, tires, wheels, and bolts. Safety is our first priority. Mechanical issues you are unaware may cause delays and it would be best to catch them prior to our parking lot drills and ride around Irvine. Trained Smart Cyclists are essential towards helping to inform other campus employees and students about cycling skills and safety. Smart Cyclists are encouraged to join the BikeUCI Ambassadors, a volunteer program to mentor, support, and strengthen our cycling community. Smart Cyclists are welcomed to volunteer at UCI Transportation’s ongoing bike festivals, including WhimCycle and uciRIDEtoberfest, and at future Smart Cycling classes. During these events, Smart Cyclists will be able to apply what they’ve learned during their training and help educate their peers on cycling.